Well isn’t the weather lovely at the moment? For those of you who aren’t in the UK, after a winter that felt like it was going on forever (it snowed in March, which is almost unheard of in London); Summer has finally arrived and we’ve enjoyed a couple of weeks of warmth and sunshine. I’m going to be honest, I didn’t think it was going to happen, so it’s been a nice surprise. 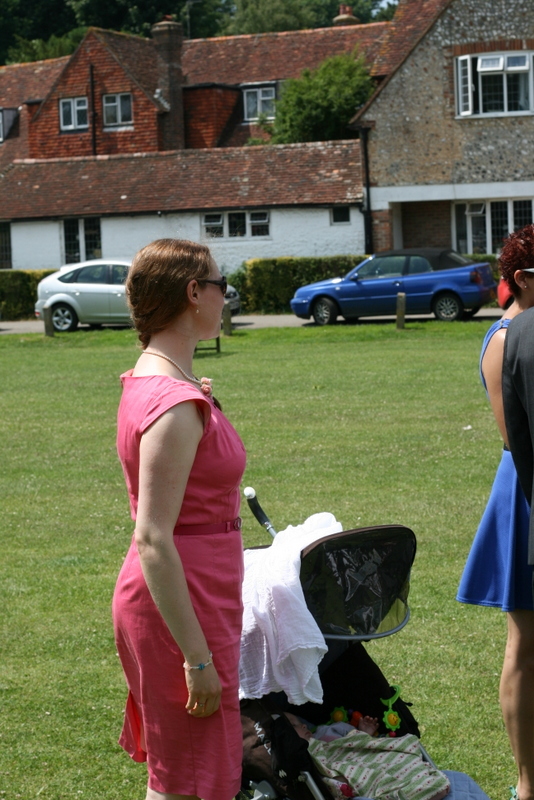 It was especially nice because last weekend, we went to a wedding and it was glorious! Weddings are always joyful occasions but this one was a family wedding and so it was extra special. You can see, there wasn’t a cloud in the sky! You can’t see it here but the Church was on top of a mound, in the middle of a green, surrounded by the South Downs. It was stunning! I didn’t manage to get many pictures of it because hubby had the camera (it was his family wedding) and I was looking after Little Miss. There I am. Hubby must have taken a sneaky pic while I wasn’t looking. You can just see in the background the beautiful village. The church itself was a lovely old church. I have a passion for old churches. I find the amount of detail and love that has gone into them, inspiring. I can imagine many crafty people over the years labouring to fill it with beautiful things. Everything is in exactly the right place and has a reason and a purpose. 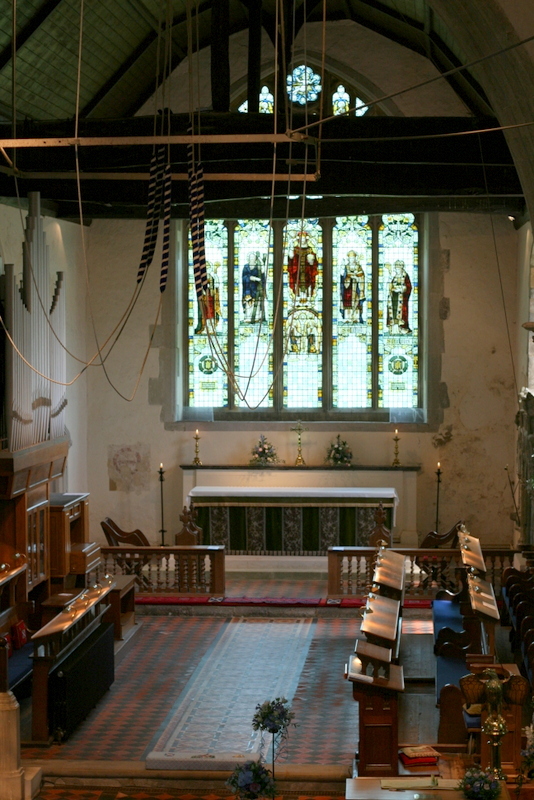 Notice the bell ropes that are let done in the middle of the church. 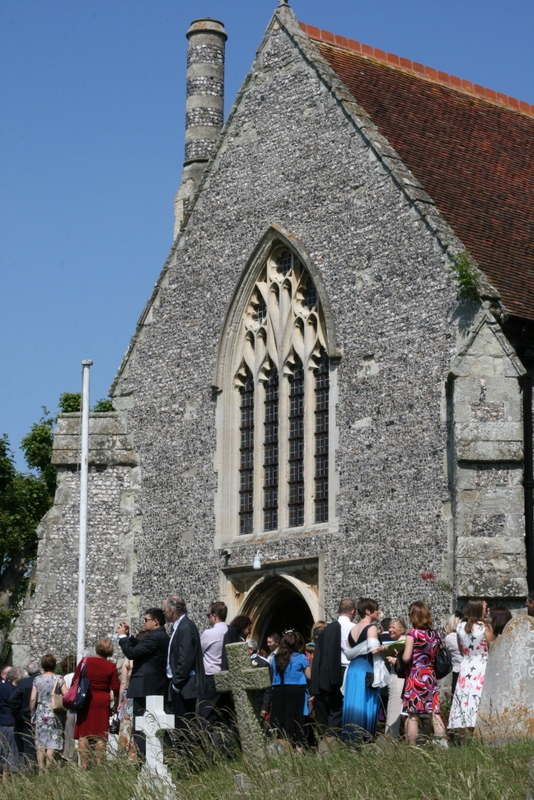 It was lovely to hear the bells being rung to celebrate the start of the couples new life together! Now I’ve mentioned the village briefly. I had no idea before we got there how beautiful it was. Apparently it’s quite famous (I’d never heard of it but to be honest that is more a reflection on me than anything else!). The buildings are really old and stunning. We arrived 3 hrs early as we needed to feed Little Miss so had decided to get lunch there. I’m so glad we did because we found a lovely little tea room with some very friendly people, who make very nice food. 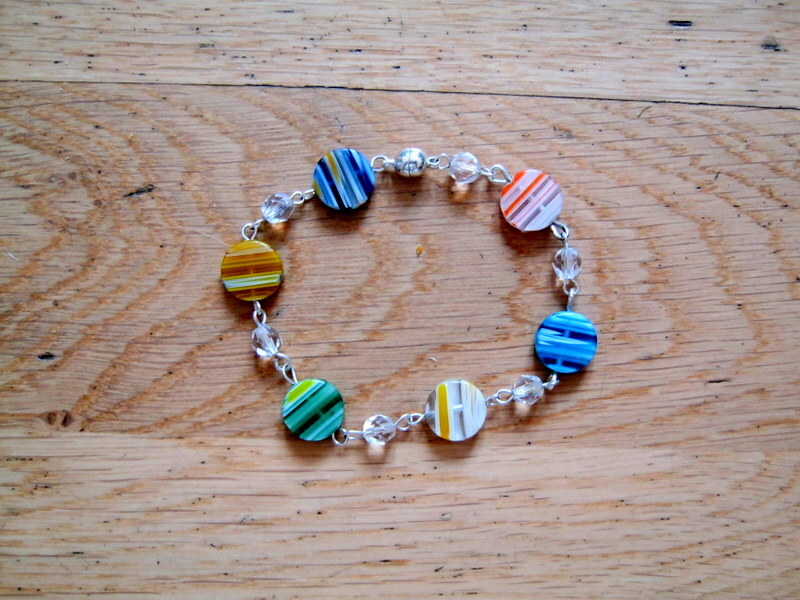 It also turns out that they make things too (yay, more crafty people!). The lady who ran the tea room makes bracelets and I just had to get one (this picture really doesn’t do it justice, it looks really nice on). 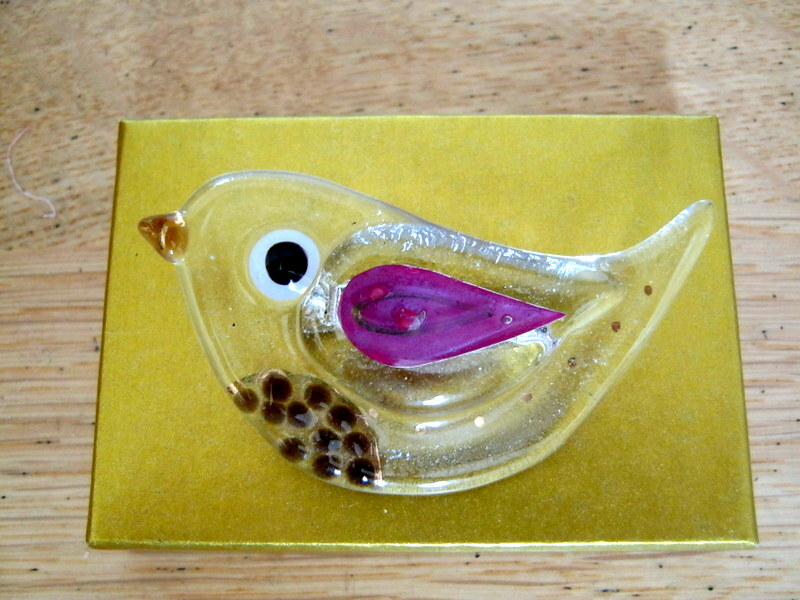 It turns out that her sister makes brooches out of glass. There were quite a few (cats etc) but I fell in love with this little chap. I’m trying to decide what I can put him on to show him off to his full potential! We’ll see how he turns out 😉 I’m enjoying trying something new as I haven’t worked with hexagons before. I’ve also been working on a couple of patterns which I’m hoping to post over the next couple of weeks, so watch this space! I love your little scissors case! 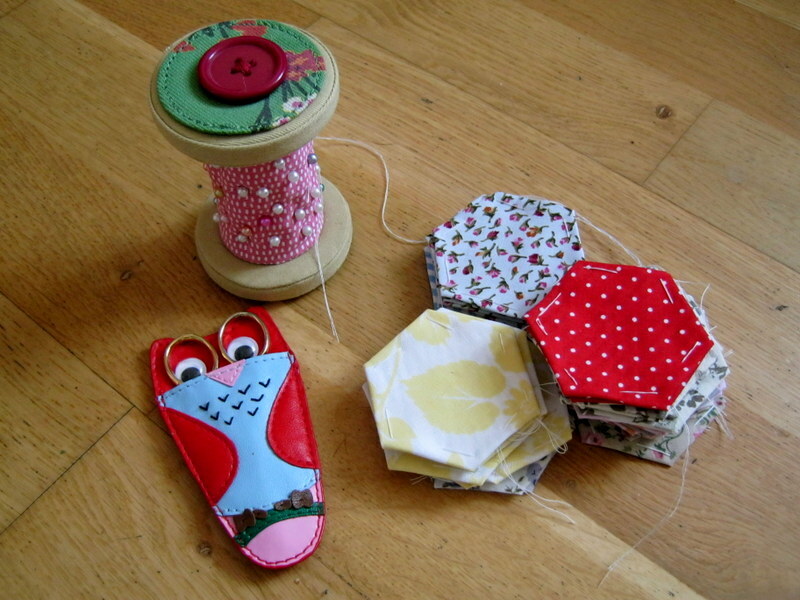 Are you making a patchwork elephant? I hope so! Thought you might like the scissor case 😉 I was over joyed when I found it! Yes, hopefully soon there will be a little elephant joining the family.